Sometimes an idea is so simple you’re amazed nobody thought of it earlier, and this is one of those concepts. Thankfully the idea waited until 1993, which meant that it got to star Bill Murray, which is most definitely a good thing. 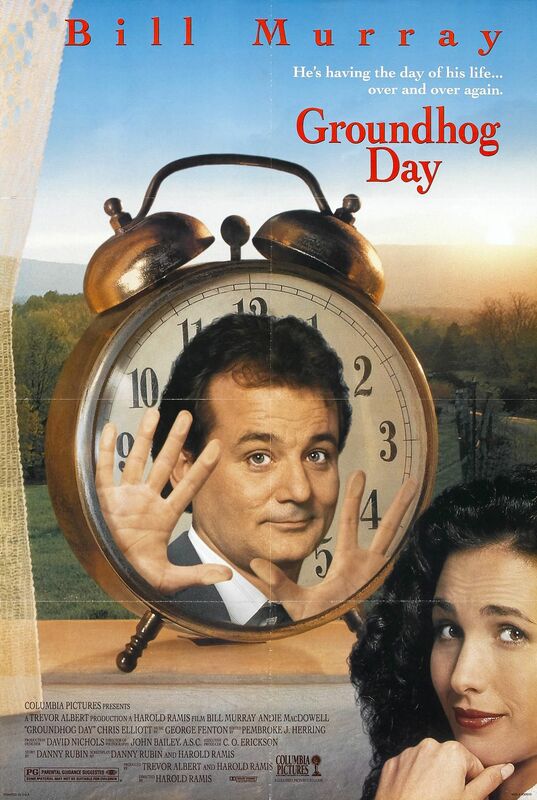 I’m a huge Bill Murray fan, and while the idea and script of this flick are wonderful, the film’s major strength is Murray doing his usual sarky, slightly sleazy schtik as Phil Connors, a TV weatherman who goes to view the groundhog day celebrations, only to find himself inexplicably reliving the same day over and over again. Phil can remember doing it all before, but when he falls asleep it all resets and he wakes up, once again at 6am to the sounds of Sonny and Cher, forced to go through it all again. 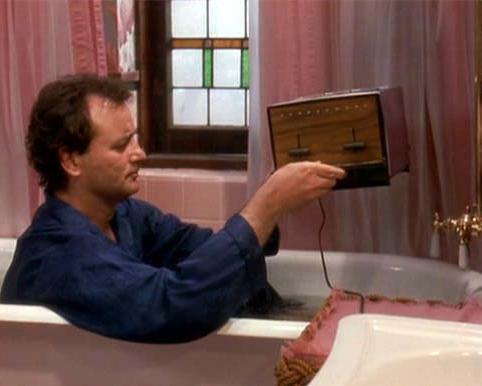 The idea of having to live the same day again and again is genius, and it’s a credit to Harold Ramis as the director that he choreographs everything that only Murray’s reactions to events around him differ. It’s also rather well done in the way that the movie handles Phil’s response to this bizarre turn of events. At first he staggers through the day thoroughly confused, fearing that he’s going mad. Then he embraces the fact he has a life free of consequence and uses it for selfish reasons. Shortly after that he falls into a funk of depression and tries to kill himself to escape the repetition, only to always wake up at the start again. People often talk about edginess in comedy, but there are few things darker or braver to do than have your main character attempt suicide, repeatedly, halfway through a romantic comedy fantasy. That’s what the movie morphs into, with Phil trying to manipulate events to woo his producer Rita, played by Andie MacDowell. He learns her likes and dislikes and repeatedly tries to build the perfect day to win her over, but something always goes wrong leading to a montage of slaps. I’m gonna go off topic here and discuss MacDowell, who I find infuriating. She always seems to have been dubbed by another actress, and is just one of those actors who rubs me up the wrong way. Despite this, she stars in two movies I adore, this and Four Weddings and a Funeral. I can’t quite work out how an actress I dislike can still manage to crop up in two movies I genuinely love, even if she is one of the weaker elements of both movies. She’s not terrible, it’s just, well, she’s kinda bland. 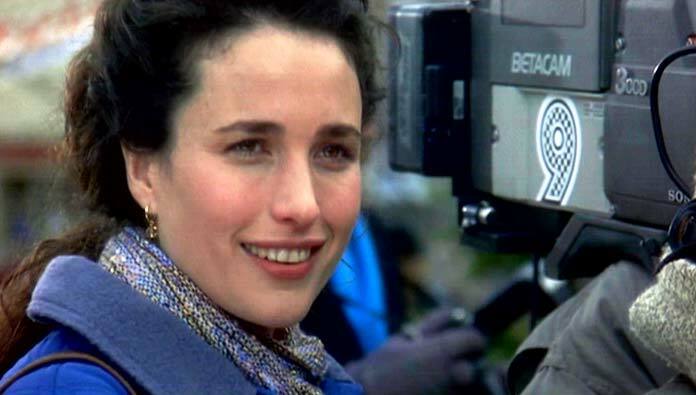 Kinda bland- Andie MacDowell as Rita, Phil’s love interest. After failing to win Rita over, Phil decides to try and use his knowledge of the day’s events to try and help as many people as possible. Using the opportunity to improve himself, through learning piano and working out where he has to be to help everyone. Finally, after a perfect day he impresses Rita enough for her to bid for him at a charity auction and the two spend the night together, with Phil waking up the next day, finally free from February the 2nd. 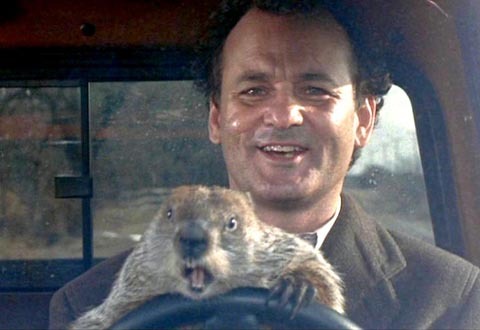 But as I’ve said, the real strength is Bill Murray who is just an utter delight in the lead role. He’s great at the sarky one-liners and manages to capture Phil’s reinvention and improvement in a way that feels natural and not too cliche or saccharine. Murray has perfect comic timing and a real knack for making his slightly roguish characters remain likable, when they could easily just come across as jerks. It’s easily one of my favourite Murray movies, and I never get tired of watching it over and over.